Sale !!!! Brand New Alternators.. We all here at Car Craft are running these on our own personal vehicles. 12v Internally Regulated. Fits all Type 1 VW Engines. If you are having trouble with which one to get, all your basic VW bugs without a large stereo system should buy the 55amp alternator with no issues. All off-road VW's with no more than 4 headlights should be able to run the 55 amp alternator. Any VW or Buggy with more than that should consider a 75amp alternator. Comes with woodruff keys. 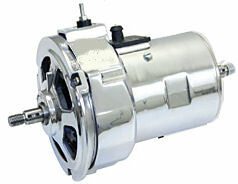 Also available now are the original Bosch 55 amp Alternators. Click Product Info to choose the one you want.